"Imagine seeing hundreds of the same type of animal gathered at the same place and at the same time! Right here in North America many animals gather in huge numbers and can be seen at predictable times and locations. Not all migrations are tied to seasonal food changes—some are tied to life cycles and the need to gather in huge numbers. Certain birds, reptiles, mammals, amphibians, fish, and even insects migrate during spring, summer, fall, or winter. 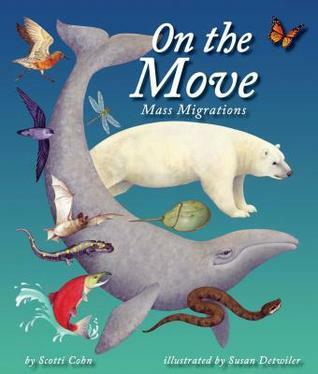 Travel along with them as you learn about what puts these animals On the Move"
Come face to face through beautiful illustrations to the mass migration of spring. Salamanders are on the move, as well as cranes and other birds returning from their winter vacation. Caribou travel north along with mosquitoes and dragonflies. Monarch butterflies and bats make a long journey in their migration in the fall. Ocean animals as well as Alaskan animals are making moves throughout the year. Mass migration where one animal in a large group is moving from one living habitat to another. A great introduction to migration as we are starting to see the birds travel back from the south this spring, home to our own bird feeders, signifying that spring is indeed here! A nice variety of animals and seasons are including in this basic book for ages 4-8. For Creative Minds in the back of the book we go beyond the book by learning about the 4 W's of animal migration. Can you think of other animals that migrate? What animals do you see in the summer that you don't see in the winter in your area? Sylvan Dell Publishing has a fantastic selection of books that go beyond a mere story, rather teach and create an interest in learning. Stop by and check them out this summer to help keep your kids minds active!